Together, Boruto and Ōnoki, the elder Tsuchikage, manage to escape the barrier surrounding Sanzu Plains. 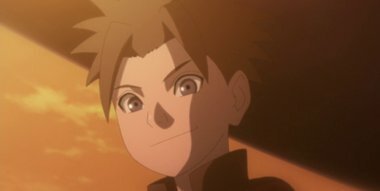 Ōnoki then brings Boruto to a place that bears special meaning to him. There, he tells Boruto about his hopes for the future, a topic he’d been pondering ever since he lost his grandson Kozuchi. Meanwhile in Iwagakure, Kū, the creator of synthetic humans, tries to take over Iwagakure in order to realize his plans before time is up.